This piece was originally published in The Australian newspaper it has been substantially updated since then. 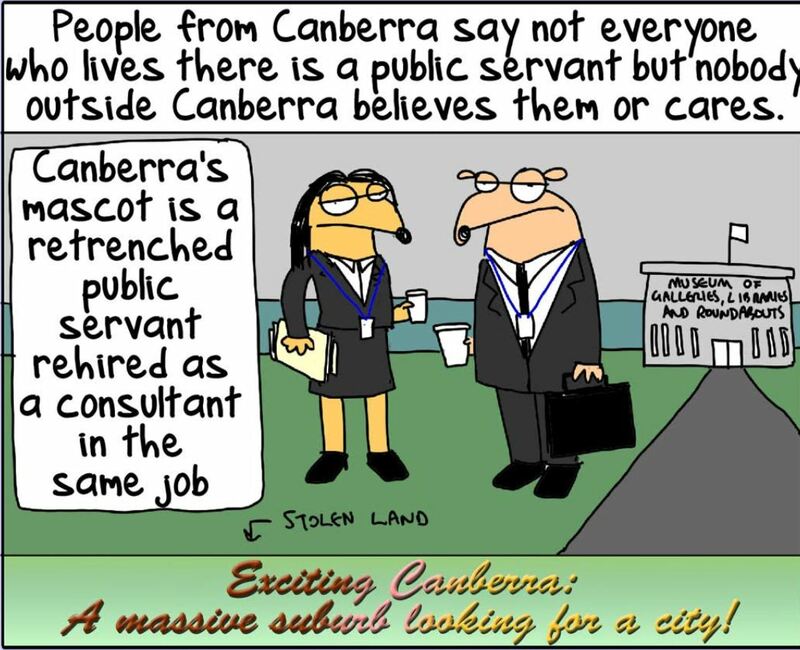 But jokes aside, we should feel a sense of belonging in the Capital, even of ownership. Not only is Canberra the seat of government and justice, but its institutions preserve our history and help establish our sense of identity. Several years ago I ventured into some of those iconic buildings, and my whole perspective of the city changed. 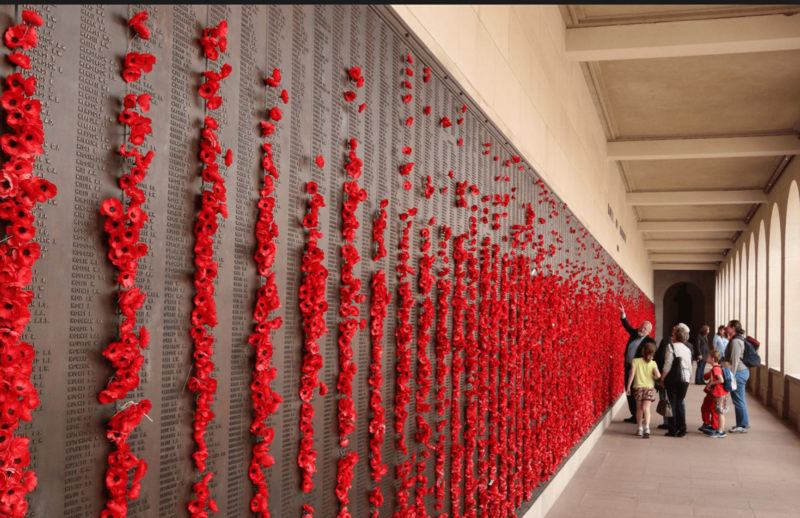 Arriving on Remembrance Day, November 11, I joined many others at the Australian War Memorial, searching the walls of remembrance for the names of our dead relatives. At the official service many of us placed poppies and wreaths beside those of the Governor General and the Prime Minister. Afterwards I visited an exhibition honouring the soldiers who fought in the trenches of France, where one of the most poignant exhibits was a battered tin sign reading, TO THE FRONT LINE. The War Memorial holds an amazing collection of diaries, personal letters and photographs, available to the public through its Research Centre. However, it is in the Australian National Archives building (located within Canberra’s Parliamentary Zone) that individual war service documents, are held . I was able to access the records of a cousin who was blown to pieces on the first night of the bloody battle of Pozières, and of my great-uncle, Arthur Singleton. Arthur fought in France after having already endured the traumatic landing at Gallipoli on April 25 1915. His battalion (the 12th) also participated at the battle of Lone Pine. According to their mission statement, the National Archives seeks to, ‘preserve valuable Commonwealth records as part of the archival resources of Australia and make them accessible to present and future generations.’ The term “archival resources’ includes films, maps, posters, sound recordings, and even architectural models. The Archives Office also holds vital information for indigenous Australians, particularly the ‘stolen generation’. An index titled Bring Them Home lists the names of Aboriginal and Torres Strait Islander children who were separated from their families. There is a special genealogical service for migrants and their descendants, through documents relating to arrival and settlement. Acting as guardian of the country’s literature is the nearby National Library. Under legal deposit provisions the Library receives a copy of every work published in Australia. The Library also preserves our grassroots social history in an extensive newspaper collection, now digitized and available on-line free of charge as part of the wonderful archive, TROVE. To the uninitiated, computerized records and microfilm readers can be daunting, but staff are approachable and unfailingly patient. Without electronic storage methods, public access would be impossible. These days the Library even archives individual websites considered important for researching the country’s cultural history. I was delighted when my own was selected for inclusion. 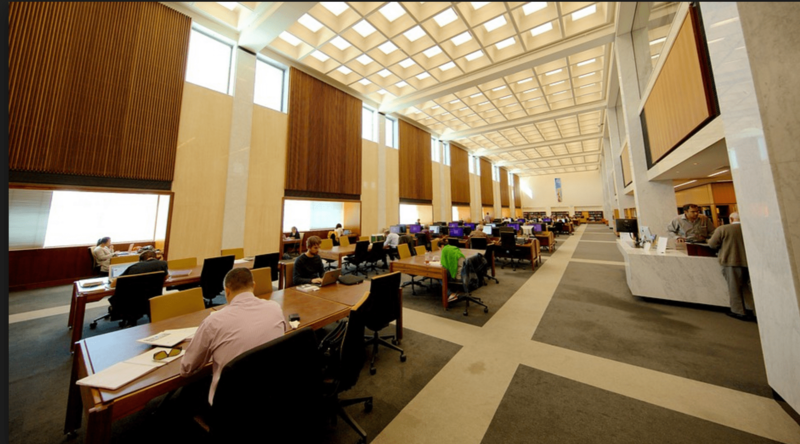 One of many study areas within the National Library. The library has many other attractions, including public lectures by well known authors and constantly changing exhibitions. Within walking distance of the National Library is the imposing High Court of Australia, a 40 metre high construction of glass and granite on the shores of Lake Burley Griffin. A wide, shallow fountain runs the full length of its forecourt. I entered this building warily, having a distinct fear of authority (perhaps a legacy of my convict ancestry) but a kindly attendant took me under his wing. He asked if I would like to attend a full bench hearing and supplied me with a two page précis of the current case. A company director had appealed to the highest court in the land after being held liable for half a million dollars of unpaid tax. Two hours later the case was adjourned. There appeared to have been little progress and I was reminded of the interminable Jarndyce vs Jarndyce case in Charles Dickens’ Bleak House. My advice would have been for the appellant to cut his losses and withdraw before owing millions more in legal fees. During past visits to Canberra I toured Parliament House and The Mint, and wandered happily through the National Gallery and the innovative Museum of Australia. But on this occasion I made a conscious effort to access the Capital’s collective memory, and to become more personally involved. As a result, the experience was far more rewarding. If my tour of the above buildings has failed to convince you that Canberra can be engaging and inclusive, let me suggest a visit to the National Botanic Gardens. This oasis of peace and beauty showcases the flora of the entire nation. 200 species of birds have been recorded here, and there are over 7,000 plant species. Despite Canberra’s harsh climate, diverse landscapes have been created, including a Rainforest Gully and Mallee area. In spring the wattles are a sight to behold and there is heavenly scent of boronia. Members of the Proteaceae family such as banksias and grevilleas are spectacular all year round. I was intrigued to hear that trees on the Garden’s eucalypt lawn inspired the 48 marble clad columns in the foyer of Parliament House. I followed the main path to a rock garden, where a sign warned visitors not to scramble over the rocks due to the presence of highly venomous Eastern brown snakes. An English tourist was clearly wondering whether he should continue, and asked me what was stopping the snakes venturing onto the path. ‘Oh I think they train them not to,’ I told him, trying not to reveal my own terror. Filled with nostalgia after delving into my family history I headed for the Tasmanian section. It lies beyond a large pond, where an egret fished with steely resolve and the musical ‘plink-plonk of frogs resembled notes being struck on a xylophone. As an expatriate Tasmanian it was a joy to rediscover the landscape of my childhood. I recognized ferns that grew around the dams on my father’s farm and found trees such Leatherwood, Blackwood, Sassafras, Myrtle beech, and the famous Huon Pine. 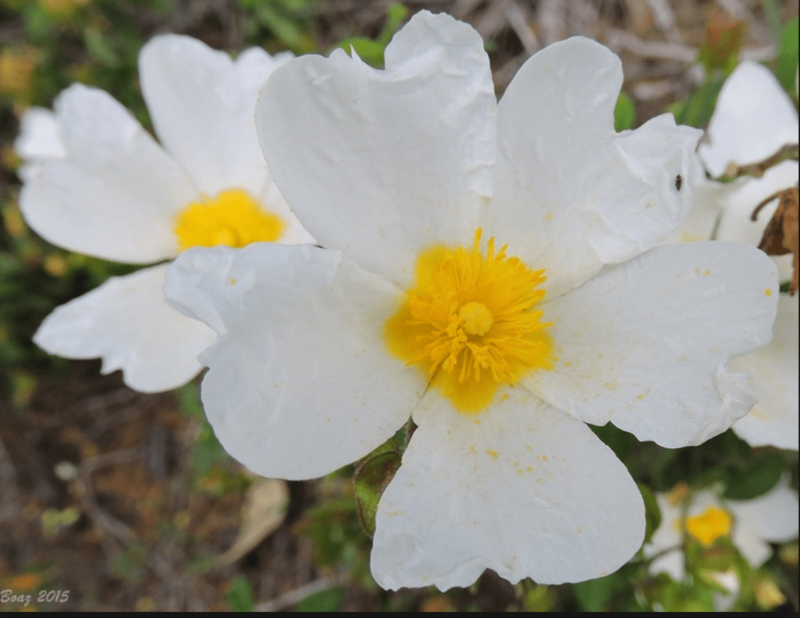 After returning home I planted a Gallipoli Rose (Cistus salvifolius) purchased in Canberra. It originally grew on the cliffs above Anzac Cove and was released some years ago by the Australian War Memorial in conjunction with the Yarralumla Nursery. The simple beauty of the Gallipoli rose. I have also been checking the High Court’s website regularly, to discover whether ‘Rumpole’ managed to achieve a positive outcome for the appellant in the tax case. FEEL FREE TO LEAVE A COMMENT BELOW. REMEMBER TO COMPLETE THE SIMPLE ANTI-SPAM SUM BEFORE PRESSING ‘SUBMIT’. How nice to see my home town and its institutions so sympathetically described. I found my visit there really moving, Roslyn. researcher’s paradise of course. Very interesting tour. It’s nice to think about warm places when we are having the coldest days so far in our winter. Thanks for sharing. Yes, have been hearing about your freezing weather. And we are having very unusual hot conditions. Pauline, We have started a tradition, of taking our grandchildren to Canberra, their first school holidays, after they start school. This year it is our grandson’s turn and I can’t wait to show him The War Memorial, Zoo, Questacon and everything else. We are busy but have so much fun. Two years time and it will be our last grandchild’s turn. Oh, that’s such a delightful tradition, Lilian. They will never forget it. Lucky kids!